Sunny Beach House on the Bike Path! AC Throughout! 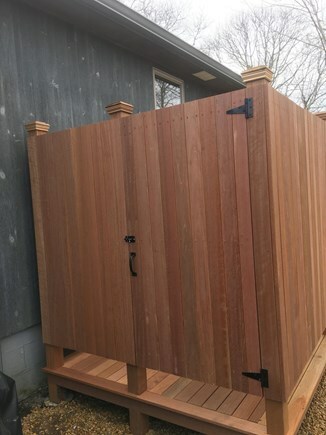 Brand new outside shower for summer 2018! 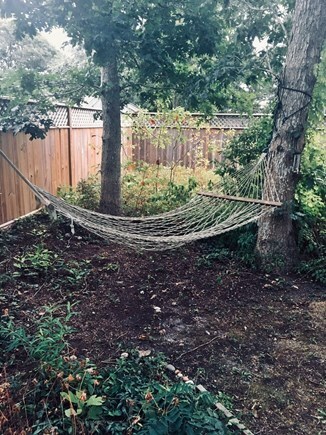 Pond-side hammock for lazy days! State Beach is 2 miles away by car or bike. End of Summer Special! 5 Nights! Sun-Fri before Labor Day; $1600; Tues-Sun after Labor Day, $1500. 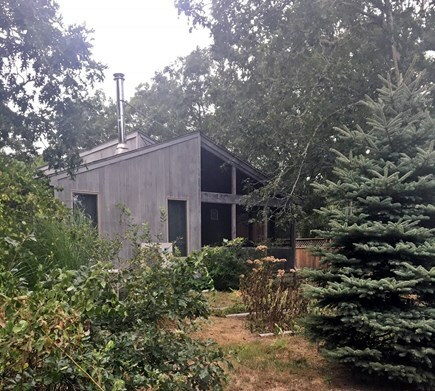 This comfortable home is ideally situated on the bike path to State Beach! Perfect for a family vacation, a romantic getaway or a gathering of friends. 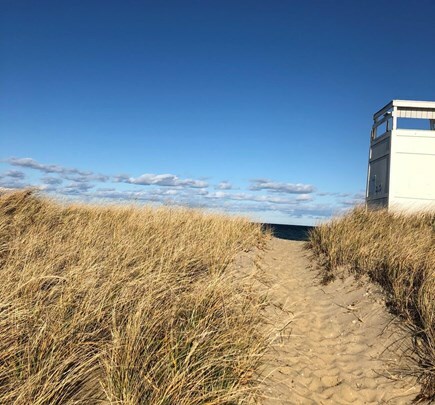 It's located mid-way between Oak Bluffs town center and Edgartown Village and just steps away from the MV bus route. Quick trip to MV Performing Arts Center by car or bus. Surrounded by nature, you will want to make this your annual Vineyard retreat. 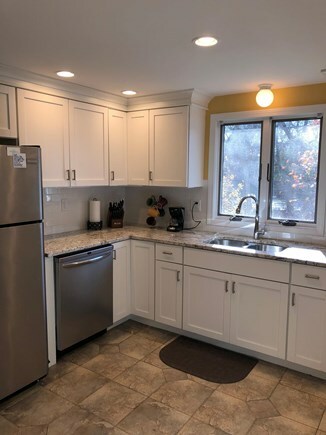 The main floor features a renovated, fully stocked kitchen, sun-filled living and dining areas, and a screened-in porch for relaxing in the spring, summer, and fall! Three steps up are the Queen master bedroom with ensuite bath, two additional guest rooms -- a Queens and 2 twins -- and a shared full bath with a tub. 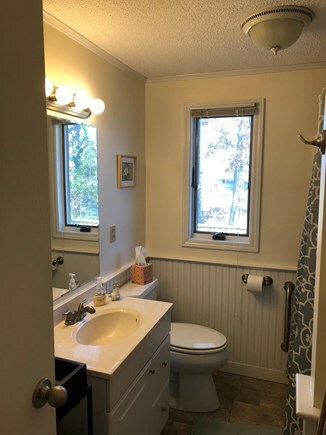 Amenities include a dishwasher, A/C throughout, washer/dryer, Smart TV, Cable, Internet, a gas grill, and a huge outdoor shower. Our home is close to the beach, golf, shopping, the YMCA, restaurants, hiking trails, and all that the Vineyard has to offer! Additional pricing info: Refundable security deposit - $350, Discount available for multiple weeks, State and local taxes of 9.7% will apply. Beautiful and quaint...The location of the home was perfect ..private as well as accessible. The interior was impeccable and super clean. Our host Yvonne went above what was expected to ensure our stay exceeded our expectations. This is absolutely our go to place when we return to the island. My family and I just got back from staying for a week in this home. The owner, Yvonne, was a pleasure to work with. She provided a clean and beautiful home with a comfortable atmosphere and was readily available before, during and after our stay. I had questions about things I would need to bring (a hairdryer, etc) and she emailed me back right away letting me know if she had those particular items already at the house. Perfect spot for us as a quick get away. All the comforts of home packaged in with all that the Vineyard has to offer. This place has all the comforts of home and the owner is very appreciative of any suggestions and or feedback. My home away from home!! 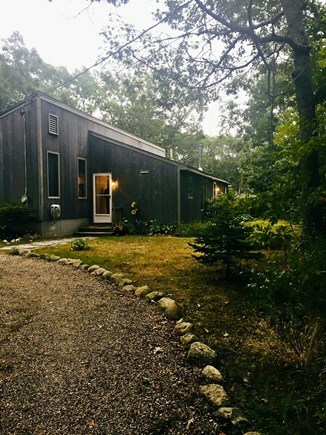 I came to MV to run my first marathon and wanted to make it an extended vacation to celebrate and wanted to rent a house instead of going the hotel route. Even before arriving to the home, Yvonne was great! She had a clear lease contract, called several times in the months prior to my arrival to ask about my needs, and answered my questions. Once I arrived, her information about how to get to and into the house were clear and easy to follow. I was so comfortable and truly felt as I was in my own home LOL and acted as such. I have been coming to the Vineyard for nearly 30 years. From my very first ferry trip, I was captivated by its beauty and simplicity. Over the years our summer visits grew into an annual two week reunion of friends from all over -- New York, Rhode Island, New Jersey, Massachusetts, Virginia, and even Texas! Through their Vineyard experiences, our children have grown up together and now come to the island with friends of their own! I have tried to make my home comfortable so that guests will feel at home there too. It is very sunny in the common areas. The southern exposure lets you experience the sunrise to the East on the enclosed patio as well as the sunset from the dining table. I love that it is on the bike path, near the bus stop and midway between two nature preserves! It is close to Oak Bluffs for popular Vineyard traditions like riding the Flying Horses or exploring the Gingerbread Cottages. There is also easy access to Edgartown Village, and Main Street shops in Vineyard Haven. I am looking forward to many years of Vineyard memories here and hope you will make some of your own as well! Edgartown is a culture-rich ''down-island'' community -- one of the original towns on Martha's Vineyard. It's home to museums, gardens, walking trails, farms, bookstores, and many quaint shops and restaurants. And let's not forget the beaches -- South Beach brings all of the passion of the Atlantic, while State Beach has the bay side calmness so welcoming to young families. From the New Year's Eve Fireworks to the Edgartown Food and Wine Festival in October, you will find all that the Vineyard has to offer right here in Edgartown!